Coaches and scouts say Mike Trout just might be the perfect baseball player. To leap, run, and swing like him, work from the ground up. If you've watched much in the way of Major League Baseball highlights this season, you've seen Los Angeles Angels of Anaheim rookie outfielder Mike Trout in action. And if you've seen him, you probably noticed there's something different about this 21-year-old phenom. Trout legs out infield singles by several feet, not just a step. His incredible vertical leap allows him to pull back home runs that even veteran fielders would watch sail over their outstretched gloves. His base-stealing success rate is a stunning 90-plus percent, and, oh yeah, he'll almost certainly end the season with 30 home runs and some of the best power numbers in baseball. 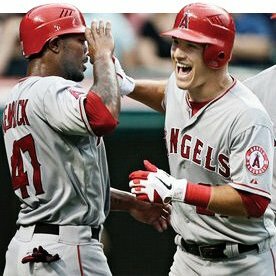 The stats say the only comparisons for Trout's breakout 2012 campaign are the best seasons put up by all-time greats like Babe Ruth, Willie Mays, Ty Cobb, and Barry Bonds. Trout's unique combination of blazing speed and muscular thickness brings another inevitable comparison: a young, healthy Mickey Mantle. This exemplifies the explosiveness he displays every time he bolts out of the box or tracks a ball toward the warning track. Why is Trout such a steely stud? Part of it is clearly that he was born with a genetic advantage. However, he also worked very hard to develop key areas through strength and conditioning. The perfect ballplayer can't be built from scratch, but if he could, I would start where Trout is strongest: in the hips, legs, and back. Power in the batter's box has a lot to do with core strength, but accessing that strength is all about the hips. If your hips don't rotate properly and maintain the high level of mobility necessary to swing a big stick, then all the core power in the world is useless. drills like cradle walks and kick-backs, both of which focus on hamstrings, adductor, and piriformis flexibility. From there, you'll want to focus on both static and dynamic core power. While planks are certainly fantastic movements, it isn't enough to simply add more and more time to them. Sports are an explosive activity, and thus they require controlled movement with resistance. Trout is said to swing a solid metal spoke from the steering wheel of a yacht as part of his workout, but for the rest of us, dynamic side planks and various types of cable chops are fantastic ways to build explosive core power. When performing cable chops, don't cheat. Work your progressions slowly for maximum benefits. When Trout was just 17 years old, major league scouts were writing things like "NFL football player" and "Brian Urlacher" on his scouting reports. According to a recent feature in Sports Illustrated, the scout who originally drafted Trout went even higher in his praise, writing "Best athlete. Best player in the world-period. Best player on the planet." Even Vernon Wells, whom Trout replaced in the Angels lineup, called him the player who would result "if people wanted to build a perfect baseball player in a video game." 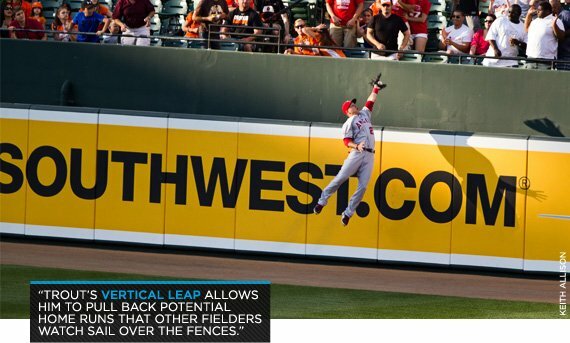 Trout's bull neck may be what stands out in pictures, but praise like this is really about his legs. A centerfielder and leadoff hitter like him has to explode into a full sprint that can carry him all the way around the bases, or all the way to the centerfield wall, then into the air to make a leaping catch. That just isn't possible with skinny legs. All things being equal, a bigger muscle can generate more force. So to train like Trout, you have to make sure to build the right amount of hypertrophy. I'm not advocating traditional bodybuilding protocols and hour-long leg days, though. When training for athletic performance, there's no time to be unable to walk for 72 hours after a workout. Instead, I recommend a combination of Olympic lifts for explosive power and single-leg movements for stability and muscle size. Don't worry about getting too intense with your Olympic lifting; after all, we're athletes, not Olympic lifters. Hang cleans will do more than enough for athletic gains. Start adding them in once per week. Single leg exercises are where you can really see the muscle growth. I prefer numerous heavy weighted movements like step-ups and static lunges. Again, the goal here is not a pump or burn, so keep repetitions between 5-and-8 in order to lift heavy weight. What about the old classics like back squats and deadlifts? It may come as a surprise, but the majority of professional athletes don't perform these movements. Why? As I see it, it's about money. Strength coaches and trainers know that if an athlete under contract for millions of dollars tweaks his back performing deadlifts, the ax will fall on them. Personally, I advocate that athletes perform these exercises, but the majority of pros will rely on single-leg exercises. The upper back may be the most commonly ignored region of most athletes' bodies. Why? As stated earlier, most athletes don't deadlift, and the majority of their back exercises revolve around pull-downs. Pull-ups are also a lost art, meaning that many athletes have become forward-rounded, with tight upper backs. Mike Trout has to get his bat around quickly to catch up to fastballs from the American League's elite pitchers, so he can't have a tight or weak upper back. Addressing this issue is rather easy, luckily for you. Start by using multiple grip variations in your seated cable, dumbbell and barbell rows. Don't worry about the weight. Instead, focus on for the squeeze and the retraction of your shoulder blades. Developing your upper back's strength and mobility has much more to do with the stretch and squeeze than it does with the actual weight you use. Perform these workouts with one day off between them, and you'll be swinging harder and running faster in no time. Catch More Trout! Follow Mike Trout on Facebook and Twitter.